The water found on the moon, like that on Earth, came from small meteorites called carbonaceous chondrites in the first 100 million years or so after the solar system formed, researchers from Brown and Case Western Reserve universities and Carnegie Institution of Washington have found. Evidence discovered within samples of moon dust returned by lunar crews of Apollo 15 and 17 dispels the theory that comets delivered the molecules. The research is published online in Science Express today. The discovery's telltale sign is found in the ratio of an isotopic form of hydrogen, called deuterium, to standard hydrogen. The ratio in the Earth's water and in water from specks of volcanic glass trapped in crystals within moon dust match the ratio found in the chondrites. The proportions are far different from those in comet water. The moon is thought to have formed from a disc of debris left when a giant object hit the Earth 4.5 billion years ago, very early in Earth's history. Scientists have long assumed that the heat from an impact of that size would cause hydrogen and other volatile elements to boil off into space, meaning the moon must have started off completely dry. But recently, NASA spacecraft and new research on samples from the Apollo missions have shown that the moon actually has water, both on and beneath its surface. By showing that water on the moon and Earth came from the same source, this new study offers yet more evidence that the moon's water has been there all along, or nearly so. "The simplest explanation for what we found is that there was water on the proto-Earth at the time of the giant impact," said Alberto Saal, a geochemist at Brown University and the study's lead author. "Some of that water survived the impact, and that's what we see in the moon." Or, the proto-moon and proto-Earth were showered by the same family of carbonaceous chondrites soon after they separated, said James Van Orman, professor of earth, environmental and planetary sciences at Case Western Reserve, and a co-author. The other authors are Erik Hauri, of the Carnegie Institution, and Malcolm Rutherford, from Brown. To find the origin of the moon's water, the researchers looked at the trapped volcanic glass, referred to as a melt inclusion. 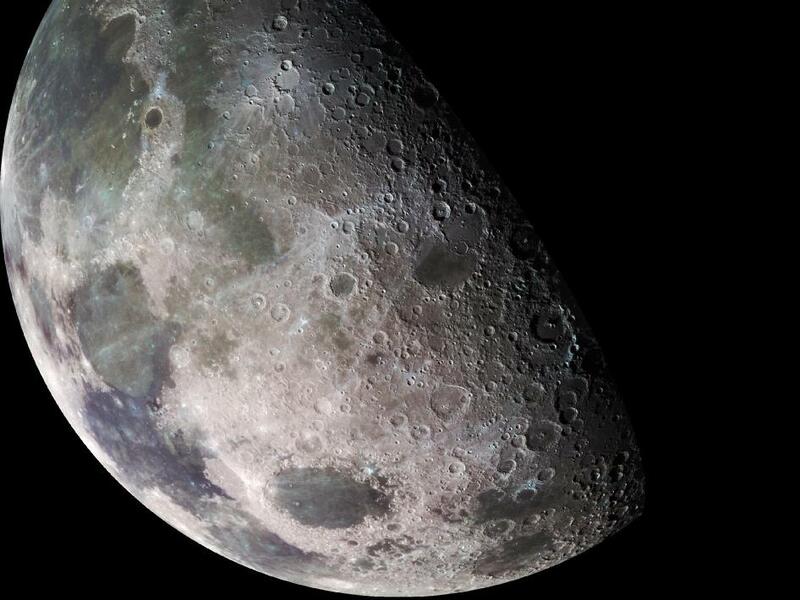 The surrounding olivine crystals prevent water form escaping during an eruption, providing researchers an idea of what the inside of the moon is like. Research from 2011, led by Hauri, found that the melt inclusions have plenty of water—as much water, in fact, as lavas forming on the Earth's ocean floor. This study aimed to find the origin of that water. To do that, Saal and his colleagues looked at the isotopic composition of the hydrogen trapped in the inclusions. Using a Cameca NanoSIMS 50L multicollector ion microprobe at Carnegie, the researchers measured the amount of deuterium in the samples compared to the amount of regular hydrogen. Deuterium has an extra neutron. Water molecules originating from different places in the solar system have different amounts of deuterium. In general, things formed closer to the sun have less deuterium than things formed further out. The investigators found that the deuterium/hydrogen ratio in the melt inclusions was relatively low and matched the ratio found in carbonaceous chondrites. These meteorites originated in the asteroid belt near Jupiter and are thought to be among the oldest objects in the solar system. That means the source of the water on the moon is primitive meteorites. Comets, like meteorites, are known to carry water and other volatiles. But most comets were formed in the icy Oort Cloud, more than 1,000 times more distant than Neptune. Because comets formed so far from the sun, they tend to have high deuterium/hydrogen ratios—much higher ratios than in the moon's interior, where the samples in this study originated. "The measurements themselves were very difficult," Hauri said, "but the new data provide the best evidence yet that the carbon-bearing chondrites were a common source for the volatiles in the Earth and moon, and perhaps the entire inner solar system." To determine the ratios that would currently be found deep in the moon's interior, Van Orman and Saal modeled the loss of gasses from inside melt inclusions and the influence of degassing on the deuterium. The researchers also had to take into account the impact of cosmic rays—high-energy rays that carry charged particles—on the water trapped inside the inclusions. The interaction produces more deuterium than hydrogen. In total, the effects proved to be small for the melt inclusions, and the ratios remained consistent with the those of the chondrites. Recent research, Saal said, has found that as much as 98 percent of the water on Earth also comes from primitive meteorites, suggesting a common source for water on Earth and the moon. The easiest way to explain that, Saal said, is that the water was already present on the early Earth and was transferred to the moon. The finding is not necessarily inconsistent with the idea that the moon was formed by a giant impact with the early Earth, but presents a problem. If the moon is made from material that came from the Earth, it makes sense that the water in both would share a common source, Saal said. However, there's still the question of how that water was able to survive such a violent collision. "Our work suggests that even highly volatile elements may not be lost completely during a giant impact," said Van Orman. "We need to go back to the drawing board and discover more about what giant impacts do, and we also need a better handle on volatile inventories in the moon." Thanks to Case Western Reserve University for this article. This press release has been viewed 767 time(s).